I was invited again on a last-minute trip for today which may or may not involve mini-golf (my addiction) but will definitely feature 3 hours of car time and therefore enforced knitting, regardless of any hoppy skippy jumpy inclinations I might experience. Yesss! oh, and with luck a trip to the best vintage store in Ontario for buttons. MUST look up the requirements for the Deco cardi before I go. 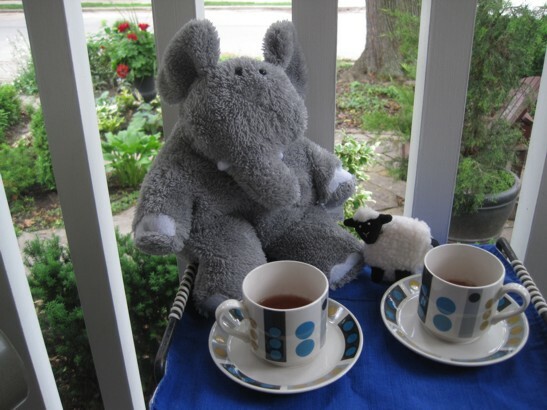 Anyway I will leave you with Hubie, who today is discussing gauge with Measuring Tape Sheep over tea. Enjoy! Please!!! Where oh where is Ontario's best shop for accessories? heh heh - It's the MCC Thrift Shop on Charlotte Street in Port Colborne ;^) They sort buttons by colour, thread matching ones together, and sell for bargain prices. It's small, but so cute, and great for 50s and 60s finds. I always have fun there!